We have welcomed in the European Union, 10 former communist countries that now account for 102 million people that is to say 20.7% of the European Union population of 492 million but only 7.2% of its GDP. GDP per capita of the Eastern countries is only 8 688 Euros per capita as compared to 27 807 Euros on average for other EU countries. In order to avoid any mistake or manipulation of figures, we have chosen to take into account the sole official value of GDP. 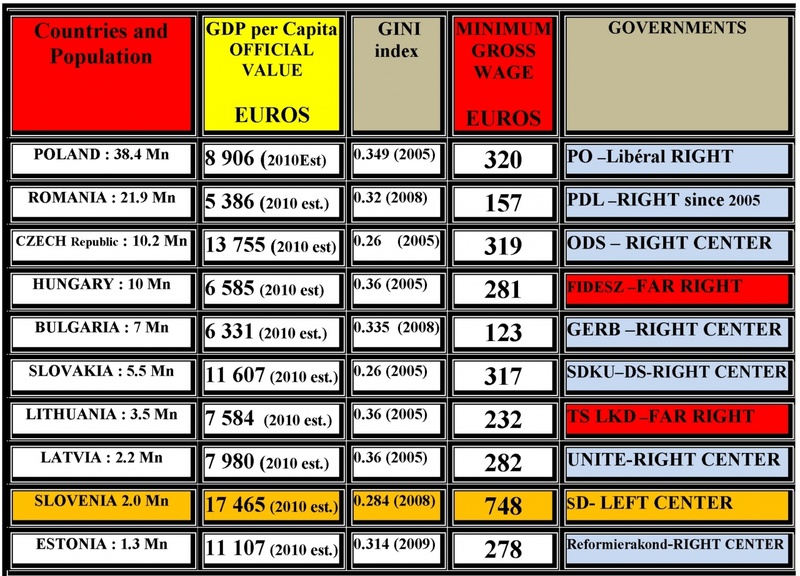 These countries suffer from poverty similar to that of emerging and minimum gross wages are included between 123 Euros and 320 Euros per month with the exception of the little Slovenia, which saw a real development and which is governed by the Center-Left. Yet people in 9 of these 10countries whose population is 100 million (excluding Slovenia) all support all Right-wing parties and in some cases Far Right (Lithuania and Hungary) that can only worsen their plight and also all strengthen the conservatism of the whole European Union. The political consciousness of citizens of these countries is obfuscated by reference to the past now very distant, with unrealistic promises, to manipulation of numbers and to the usual fact that people of these countries have learned to be satisfied with the simplest survival. An effort should be made by the French organizations and Parties of progress to help the organizations and Parties in those countries that promote a strong social policy, which is extremely needed by their citizens. We must also help them to improve their communication with their people very concerned with their difficulties and who elect Parties, which only may worsen their lot. Socialism and the values of progress are internationalist and most countries in the European Union and particularly France, will have to pay a high social price if the EU continues to be dominated by the Right wing helped 100 million people against their own interest. 1-GDP is increased beyond reason taking into account the local prices by a so called weighting by purchasing parity achieved by Economic Institutions and by the economic service of the CIA (public release in their World Factbook). The value of GDP is sometimes even doubled. 2-By the intensive use of percentages the same Institutions and CIA try to demonstrate a substantial progress, which does not exist. When we start from scratch or from a little a strong increase in percentage is still a little. People benefit of additional absolute value of PIB and not of the percentage figure. High percentages can be achieved in emerging countries without real consequence for the population. The end of communism has brought freedom to these countries but they are still very far from the expected Eldorado. Under communism people suffered the restriction of movement but today this restriction is imposed by the limited purchasing power. We must help the citizens of these countries to view more clearly a situation that has been obscured for them to avoid their support to people damaging their life. In order to be more precise regarding this situation we will produced a detailed survey of Poland, which accounts for 38% of the population of Eastern member of the European Union.